Along with the General Assemblies of Mountain Wilderness International and proMONT-BLANC (the associations umbrella for the Mont Blanc protection ), a little crowd of mountain purists met in Chamonix during the week-end of June 15 in the Chamonix Valley. 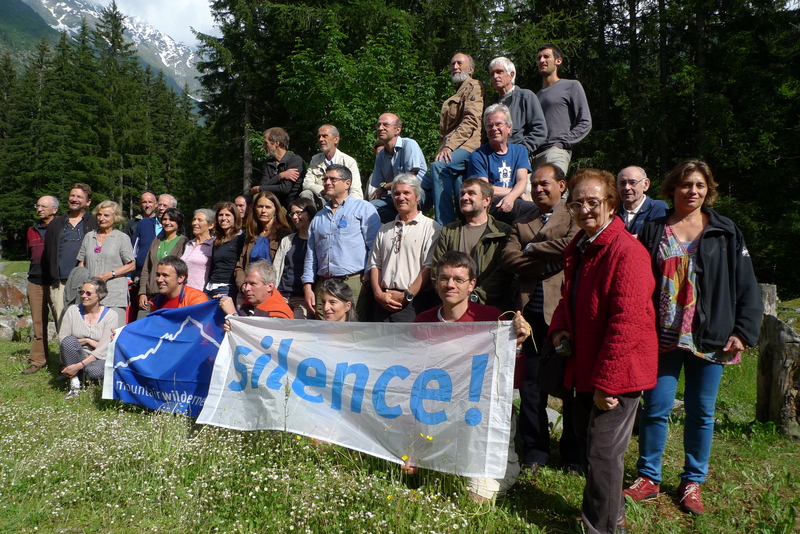 Beyond the traditional statutory work of the associations the participants wanted to highlight their continued commitment to the protection of Mont Blanc, and to the preservation of wilderness spaces not only in this Alpine area but also in all the European mountains. Eight mountaineers of various ages (Christophe Dumarest, Yoann Joly, Amy Bernard, François Labande Carlo Alberto Pinelli, Sébastien de Sainte-Marie, Claude Eckhardt and Carolina North) came together in the Majestic hotel to share with the public the experience of their relationship with the mountain environment and to explain how their practice in these pristine spaces helped them to become the fully living and sensitive human being they are today. These folks, some very young other less, simple climbers or seasoned mountain guides, other dubbed by their peers in prestigious Mountaineering Associations, have explained how much their wilderness experience had affected their lives, often growing them to become more self-confident, or to reconstruct oneself after an accident, to finally find in a “pacified” mountaineering practice the fullness of great scenery and the brotherhood of the climbing rope. They also spoke of the difficulties to sometimes find this wilderness nearby in our overbuilt mountains, which sometimes pushes them to run across the world to find a peaceful or a wild place. Testimony is the story of this freezing bivi in the crude Eiger’s north face, watching the dancing lights and the sound of snow groomers at the foot of the face. One of them went on to described its genuine pleasure of camping atop an easy mountain with his little and marveled son in the heart of a National Park,… And all of them had this dream for future generations to be able to experiment this sense of grace! Getting these feelings in the Mont-Blanc was the subject of another panel session during the weekend. 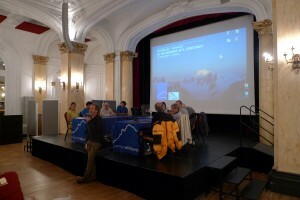 The debate, moderated by François Carrel, a journalist, included some, local and regional politicians, state representatives and some mountain environmentalist leaders. The first objective of this panel was to make known all the work currently in progress within the « Espace Mont-Blanc » to provide a new tri-national management plan for the range. 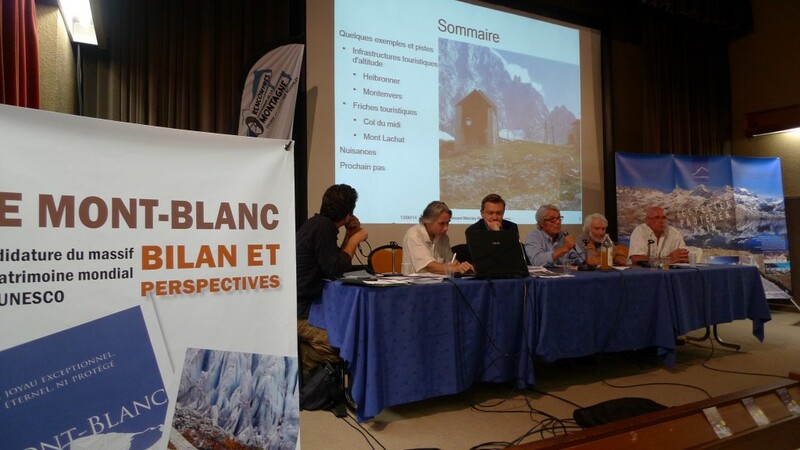 Best known as”Future Strategy for Mont-Blanc”,its aim is to ensure that a coherent policy is put in place addressing all the major issues across the Mont-Blanc territories. The second was to allow all the stakeholders representatives (community, state, associations) to express their ambitions and wishes for the range, This has been achieved. To illustrate this, all players were in agreement to state that the acceptable boundaries of real estate developments had been crossed over and that we were already moving fast toward a critical threshold marking the end of a good environmental sustainability level. For all of them, the Mont Blanc is still a major issue and a challenge which deserves to be addressed from multiple perspectives: nature, land management and living space. Barbara Ehringhaus (proMONT-BLANC President), underlined that “the relationship between elected officials and associations have evolved from a frontal opposition to a constructive cooperation”. Following these debates MW International and proMONT-BLANC have adopted a motion inviting all the territory stakeholders to have greater ambitions and a stronger commitment to preserve this exceptional Mountain Range and in getting really involved in developing and implementing the « Future Strategy » for the environmental goodness of the Mountain, the Valleys and their Inhabitants. ..
On the Airspace Management and Touristic Flyovers issue the associations have requested, for the entire Mont-Blanc territory, a similar regulation to the one currently enforced in all the Natural Parks and Natural Reserves of France in order to preserve the quietness of its wild spaces, its inhabitants and its visitors for a better appreciation of this breathtaking scenery and for an improved quality of life.